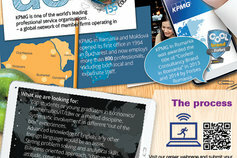 KPMG has been in Romania and Moldova since the early ‘90s and has grown remarkably since its beginnings. We now have more than 800 staff members, delivering quality Audit, Tax and Advisory work from 6 offices: Bucharest, Cluj-Napoca, Constanta, Iasi, Timisoara and Chisinau. KPMG champions a performance culture that recognizes potential, nurtures talent and rewards achievement. We are forward-thinking, passionate experts who possess the ability to constantly look beyond the "now". This is why we are always on the lookout for young, talented and motivated professionals who show a genuine interest in our field of activity. KPMG is a great place to build a career. You have the opportunity to be part of one of the coolest brands of the new generation! That’s right, you can find us in the Forbes Romania Top 100 Coolest Brands in 2013, 2014 and 2015. Apart from the coolness factor, you will be offered amazing professional challenges, excellent chances to test your academic knowledge, invaluable industry understanding and on-the-job learning from our experts as well as adventurous career possibilities! Your benefits and your career path can be flexible to match your own priorities.